Trove Tuesday, I am featuring the drowning death of Robert Alfred Stephens. Robert was the son of Charles Stephens and Dora Ethel Woodward. Charles was the son of William Stephens and Susannah Campkin. I’m descended from Susannah’s son George Oliver, by her first marriage to Frederick Oliver. I was sent a family group sheet from a descendant of Charles Stephens and Dora Woodward which showed that Robert was born 26 January 1917 at Bairnsdale, and died 15 October 1936 at Orbost. Now that MyHeritage has included the Australian Newspapers collection in their SmartMatches, I have been using these to pick a person to do for my Trove Tuesday post. 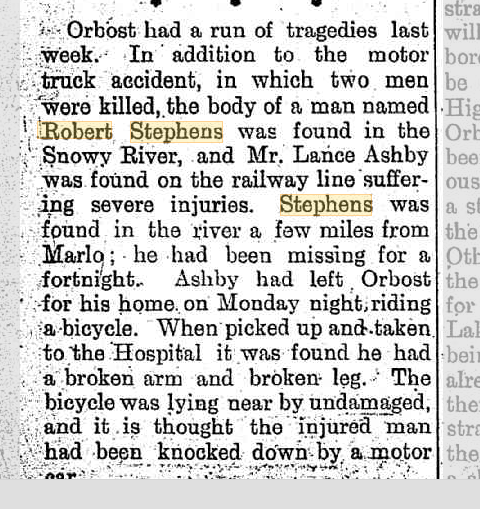 I found an article about the drowning death of a Robert Stephens in the Snowy River. Since this was in a New South Wales newspaper, I wanted to verify that this entry was for the same Robert Stephens, so I entered the search “Robert Stephens” on Trove, and selected the year, 1936, and the month October. I found two articles about Robert’s drowning death. This second article was the one I originally found on MyHeritage.